Every time I visit our IT guy, he picks up a marker and draws feverishly on his whiteboard. At first glance, I am unable to decipher the circles and lines randomly placed across the board. Or how they will help explain why I can’t get the images to print from my computer. But, after a deep breath and a closer look, the drawings start to speak to me. It gives me an understanding that visual aids really do help to convey your message. 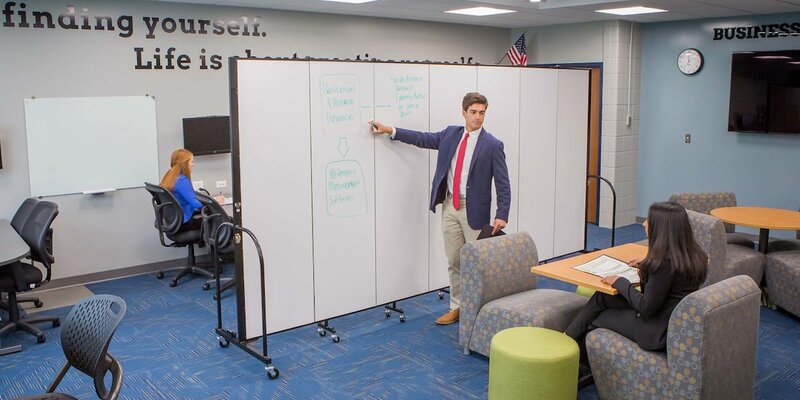 This discovery led me to realize how helpful whiteboards are in meetings, classrooms, or group discussions. However, just like any tool, is should be used responsibly to be effective. Here are a few tips on whiteboard etiquette. Make sure you use the correct marker. Ok, this may seem obvious to you, but I have been known to use a sharpie on a few dry/wet erase boards in my time. Take the time to test out the best marker for your surface. With a wet erase surface, be sure to have proper cleaning material nearby. Use various colored markers to emphasize headings and key topics. As you write, draw arrows/lines back to other written material. But, don’t add too many to create a visual distraction. Slow down and write legibly to clearly convey your message. Erase vertical, not horizontal. Seems like there are two reasons behind this theory. One, the residue from the markers falls onto the ledge at the bottom of the whiteboard. Two, erasing vertical prevents your backside from moving from side-to-side, causing a visual distraction. Allow others to give feedback to the material. Draw an idea box on the whiteboard to gather feedback or suggestions. Giving it a proper space eliminates distractions. Capture a picture. A cell phone or IPAD image is a simple way to save your material and email it to those in attendance. As a result, I have become a true fan of whiteboards for brainstorming sessions, community/employee engagements or training, and teaching sessions. They are the ideal solution to convey information. With this in mind, I no longer cringe when the IT guy takes out his marker and begins drawing. I simply pause to take it all in, one stroke at a time.